Dr. Richard Wolfert “The Toothboss” presents the first Smiling Neighbor award winner, George Raymond, with a Sonicare tooth brush. As a dentist for the last 20-plus years, Dr. Richard Wolfert, AKA “The Toothboss” has focused his practice on improving his patient’s smiles. With his new Smiling Neighbor program, Dr. Wolfert is recognizing people in the community who, through their own generosity and acts of kindness, have made their fellow citizens smile. The first winner of the Smiling Neighbor award is George H. Raymond of Weymouth. As the winner of the Smiling Neighbor, Raymond had the choice of receiving a $50 gift card to Stockholders or a Sonicare Easy Clean model (George chose the Sonicare). “I’m quite honored by this recognition. 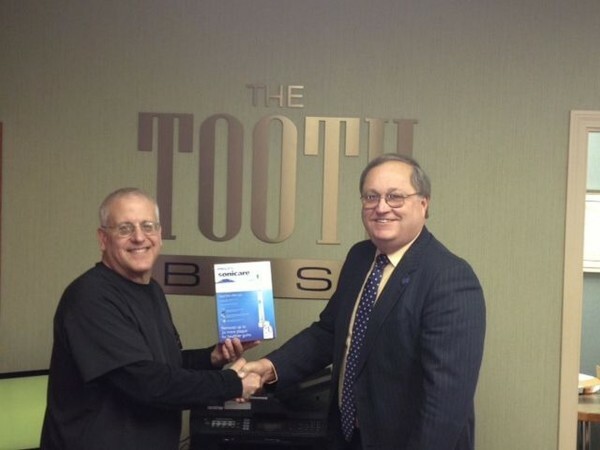 It is good to know the Toothboss is watching,” said Raymond, owner of Herbert W. Raymond & Son, Realtors® in Weymouth. The Smiling Neighbor award will be given out on a quarterly basis to citizens of Weymouth going above and beyond the call of duty for their fellow citizens. People can nominate a Smiling Neighbor by sending an e-mail of 200 words or less to toothboss1@aol.com. Please remember to include your name and telephone number as well as the name and telephone number or e-mail of the person they are nominating. Nominations can also be sent to The Toothboss, 1121 Main Street, South Weymouth, MA 02190. The Toothboss offers: comprehensive examinations (written treatment and treatment plan provided); cosmetics; crowns, bridges and tooth-colored restorations; partial and full dentures; periodontics (early cases treated); oral surgery; restoration of conventional and small diameter implants; and emergency services (24-hour emergency phone number available). The Toothboss accepts most insurance plans. They also accept payment from most PPO and indemnity plans, including Blue Cross/Blue Shield and Delta Dental. They also accept all major credit cards and have arranged payment plans through CareCredit. To schedule an initial consultation, please call 781-335-0604. For more information, visit www.toothboss.com.